Poet, essayist, and critic Vijay Seshadri was born in India and came to the United States at the age of five. He earned a BA from Oberlin College and an MFA from Columbia University. 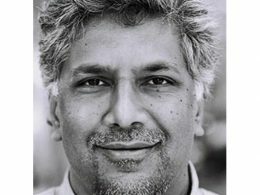 Seshadri is the author of Wild Kingdom (1996); The Long Meadow (2003), which won the James Laughlin Award; and 3 Sections (2013), which won the Pulitzer Prize in Poetry. The Pulitzer committee described the book as “a compelling collection of poems that examine human consciousness, from birth to dementia, in a voice that is by turns witty and grave, compassionate and remorseless.” Seshadri has received fellowships from the New York Foundation for the Arts, the NEA, and the Guggenheim Foundation. He has worked as an editor at the New Yorker and has taught at Sarah Lawrence College, where he currently directs the graduate non-fiction writing program.